Rolled edges provide a soft touch on all vehicle surfaces. 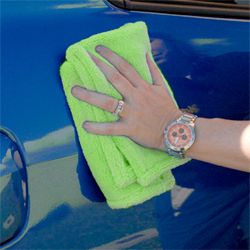 Super Soft Deluxe Green Microfiber Towels will become your go-to detailing towels for buffing paint to a deep gloss. Super Soft Deluxe Microfiber Towels are a luxurious blend of 75/25 microfiber with rolled edges for added protection against scratching. The 16 x 16 inch size and soft weave make the Super Soft Deluxe Microfiber Towels a smart choice for detailing all surfaces. Super Soft Deluxe Microfiber Towels are almost too luxurious for detailing! But that's exactly what makes them so perfect for your car. Super Soft Deluxe Microfiber Towels will not scratch or mar any surface. Use them on paint, glass, chrome - you name it! The soft 75/25 blend of polyester and polyamide pampers every surface it touches. The most unique feature of these towels is the rolled edges. Each Super Soft Deluxe Microfiber Towel is all microfiber from edge to edge! There's no risk of the edges stiffening or snagging. 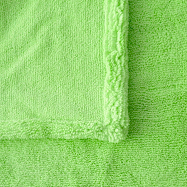 Super Soft Deluxe Microfiber Towels stay soft detail after detail, wash after wash.
Super Soft Deluxe Microfiber Towels have rolled edges for added protection against scratches. The Super Soft Deluxe Microfiber Towel is ideal for gently buffing off quick detailers and waterless washes. Super Soft Deluxe Microfiber Towels have removable sticker tags so they won't get in the way while you detail. Remove the stickers before using or washing the towels. Wash Super Soft Deluxe Microfiber Towels with Pinnacle Micro Rejuvenator to remove tough residues and maintain the microfiber's softness. Avoid fabric softeners and bleach. Tumble dry on low heat or hang to dry. When the job calls for a soft but durable towel, you need Super Soft Deluxe Microfiber Towels. Sold in multi-packs, Super Soft Deluxe Microfiber Towels are a fantastic value!